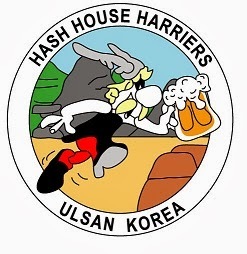 The 485th Ulsan Hash leaves from outside the Foreigners Compound Clubhouse at 10:00 am Sunday 24th September. The Hare will be “Relative Humidity", "Tea Leaf" and "Snow White". Soup after the HASH will be provided by "Backwards"
Familys especially welcome, its good for the children and fun for the parents.